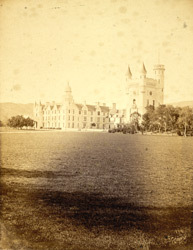 "Approaching the Castle, which consists of two blocks of buildings, connecting wings and projecting Ball-room, the visitor is particularly struck with the massive tower which rises to the height of 80 feet, and is surmounted by a turret with circular staircase 100 feet from the ground. The mountain scenery from the top of this tower is seen to great advantage. 'Crag o'er crag, and fell o'er fell' rear their heads in every direction, but high over all, proud Lochnagar sits frowning in his majestic glory. Looking along the course of the Dee, the beautiful windings of the river may also be observed with its rich banks, which yield to none in magnificence and splendor."